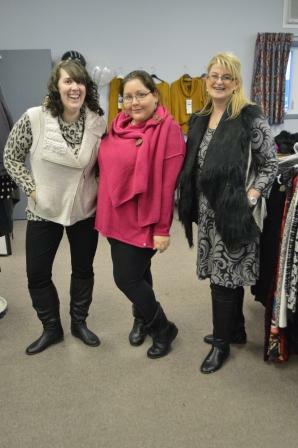 « APHRODITE POP UP STORE IN LABRADOR! Trista, Catherine and Tina – my dressy, dressed up team. We are having a blast here up here in Labrador – but our beginnings were rather auspicious. If anything could go wrong it kind’a did. First was getting the merchandise here – a combination of snowstorms up here and the rush of Black Friday orders – our deliveries were no where to be tracked. The staff of Frank Lyman headquarters turned themselves inside out to ensure their fabulous goods got delivered at the last minute. And they did. And they’re fabulous! Karley Smith’s jewels were the only package that got delivered as promised. (They are angels who make delicate and beautiful jewellery for angels.) One shipment just plain got lost without a trace. Another major one got here the day before the opening – well half of it. No one knew where the rest of it got to. I arrived on Wednesday night – on the same plane as the Frank Lyman shipment. My dear friends, Leander and Melinda met me at the airport with their big truck (everyone has one up here) and once I was on terra firma we waited for the cargo to unload and there it was! Eight big boxes of glorious goods that told me I wouldn’t be spending the week in Melinda and Leander’s hot tub. Thursday was set up day. First thing, I was meeting my helper and a lady named Norma who was bringing me some rolling racks. I headed out good and early from Northwest River where Melinda and Leander live – about a half hour drive from Happy Valley Goose Bay where the sale was taking place. They were gracious to loan me their old Nissan XTrail SUV. I followed Leander in his big new pick up where my goods from the airport are stored and about halfway the XTrail starts chugging and then just quits. I phoned ahead for Leander and he turned back. Turns out I’m out of gas (the gas gauge stopped working in 1976). So we turn back to Northwest – collect the Jerry can and we headed back to Goose. By the time we got there Norma’s in a big flap not knowing who this Tiiu was and where she was to. We arrived at the Labrador Inn faced with a big empty room and another eight big cartons that had just arrived in the nik of time. Soon after, Catherine arrived – my wonderful little helper. Together we worked like the Dickens unpacking and receiving all the goods and ten hours later we had things under control. Me and the trusty XTrail made it back to Northwest in one piece – on icy roads through the wilderness. People here are tough! Next day – some shipments still missing, I got in very early to finish up the pricing and merchandising in time for a private appointment with a potential customer – and right on the nose – at 10 am sharp I finished the last price tag. But the customer doesn’t show. Sigh! We officially opened at noon and just as I’m about to make my first sale I can’t open the cash box that Leander has loaned me. No way! It just won’t open! Then like a vision Leander showed up and I tell him I need help – again. All I’ve got in the way of tools is a screwdriver. All Leander has is an axe. So he takes the cash box into the adjoining change room (a nice spacious 1200′ of roomy comfort) and he does some strategic smashing and re-enters the sale room – victorious. Cash box is working smooth as silk. He leaves. Next customer is ready to pay and the box is right back to it’s frozen state. Leander and his axe are halfway back to Northwest. I’m on my own. One terrified customer later, me and the screwdriver do the job. Yes it’s mangled but it works. And now this cash box knows who’s boss. Did I tell you my special order of very pretty bags and tissue never did arrive? So Leander gave me a box of gray plastic bags from the gas station he owns plus some small packages of tissue he was selling in the convenience store – some with Santas on them. Halfway through our first day of selling three humongous shipments arrive! My helper Catherine becomes suicidal. Twelve hours later I was on that road heading back to Northwest. No, that wasn’t enough. We were invited for cocktails that night. Did I tell you Labradorians are tough? Saturday: I slept until 9 am. The sun is shining and when I got to Goose the place filled up with excited ladies who are graciously helped by my new best friend Tina and my old friend Trista and my dear and trusty helper Catherine. Once the flurry abated we had some time to play dress up. And that’s where my story ends for now. Have a look…. Stay tuned, I can almost guarantee there will be more stories from way up here – in the boreal forest of Labrador. And if you’re from here – please be sure to visit us right away because we’re only here until Tuesday night. Those customers who have discovered us are pretty pumped. It really is a great sale! 25 – 75% off on some of the nicest clothes you can imagine! Sunday 12 – 6. Monday and Tuesday 12 – 8 and Wednesday – sayonara! If you really like us we’ll come back!